New rules at the Court Square garage force drivers to wait for hours for monthly parking permits, residents say. COURT SQUARE — A change in rules at a parking garage in Long Island City has made getting a monthly parking permit a cut-throat competition rivaling the "Hunger Games," according to residents. 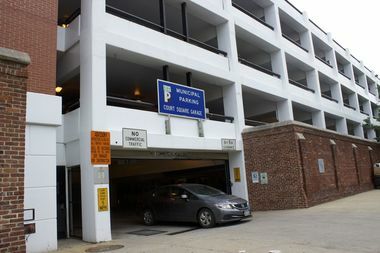 Those vying for a long-term spot at the Court Square Municipal Parking Garage must now wait in line for hours hoping to score one of its coveted monthly parking passes, after the Department of Transportation slashed the number of available permits from 330 to 210. "It's like 'The Hunger Games,'" said nearby resident Chris Nicodemo, who said he heard one of his neighbors compare the process to the post-apocalyptic series, an analogy that seemed apt. "You have to really fight for a monthly permit. If you don't, too bad, you're out of luck for the next 30 days," he said, saying he's been parking his car at the garage for seven years. The DOT revised its system for granting monthly permits in May, in what the agency said was an effort to make the process more fair and create additional spaces for those looking to park in the neighborhood for just the day. Previously, residents with a monthly pass were able to renew their permits each month for one of the garage's 330 spaces — which meant the DOT was often turning away drivers who wanted to purchase day permits at the lot. The new policy doles out 210 monthly permits each month on a first-come, first-serve basis, while the other 120 spots are used for short-term parking, according to a DOT spokeswoman. "No spaces are being lost with this change in policy," the spokeswoman said. "This not only allows for all motorists to have a fair chance to apply for a monthly permit, but also allows for more short-term parking in the area, which is home to several courts, a museum and a law school." But residents say getting a monthly pass now means lining up once a month on the day they're given out and waiting for hours early in the morning. "People are queuing up as early as 6 o'clock in the morning," said Nicodemo, who says he waited three or four hours to get his most recent permit. "It's ludicrous." A new dad with a 3-month-old baby at home, he said trying to find street parking in the neighborhood means sometimes having to walk more than half a mile from his house. "We've been loyal tenants, a lot of us...for seven, eight years," he said of himself and his neighbors. "Having individuals take precious time away from work to stand in line for a permit each month is ridiculous and insulting," said local business owner Martie Holmer, according to a press release from Councilman Jimmy Van Bramer. The councilman held a rally Friday calling on the DOT to restore the number of monthly parking passes and reenact its previous policy. "Parking is precious in Long Island City and to take away these much-needed spaces is dead wrong," he said in a statement. The problem is exacerbated by the fact that DOT workers parks many of its own cars in the garage, according to residents and Van Bramer's office. A DOT spokeswoman admitted that the agency does park some of its cars, which carry speed camera equipment, inside the lot. But the spokeswoman said they don't take up any of the 330 public spaces there. The agency is planning to review its new system in the next several months and make changes if needed, the spokeswoman said. They are also planning to debut an electronic permit reservation system this summer, to speed up the process of getting a pass, she added.